English: King of Saxony's bird of paradise, enamelled bird of paradise, enamelled bird; French: Paradisier de Prince Albert; German: Wimpeltrager; Spanish: Ave del Paraíso Rey de Sajonia. 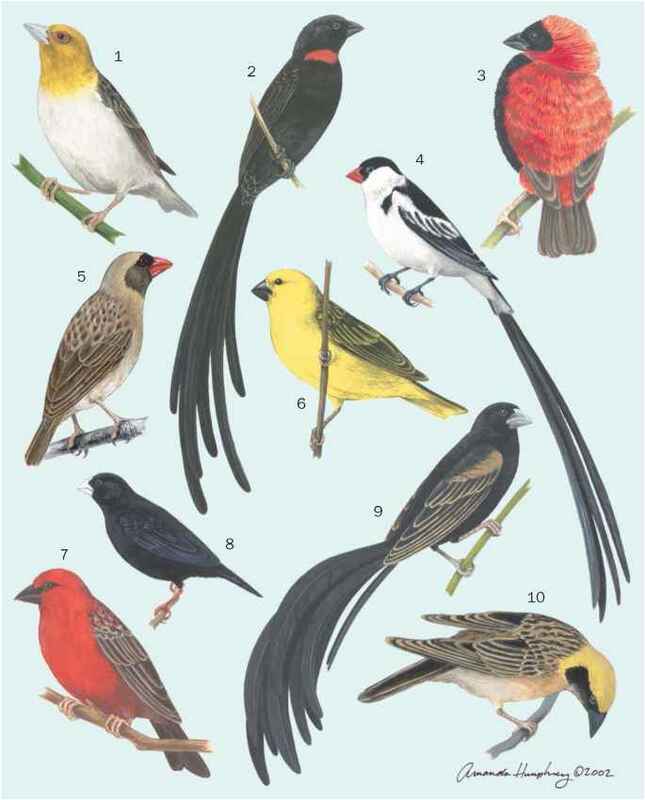 8.3 in (21 cm); 19.7 in (50 cm) if head plumes of adult male are included; female 0.15-0.19 lb (68-88 g), male 0.18-0.21 lb (80-95 g). Head, mantle, and back is deep black with dark, bronze-green sheen. Occipital plume behind each eye has a bare central shaft with 40-50 "flags" decorating its outer side; the upperside of each is blue while the underside is brownish. Chin and throat is black with highly iridescent violet tips. Breast, abdomen, and vent dark yellow; brownish rump and tail. Females are brownish gray with black-barred white underparts. Western and central two-thirds of the central cordillera of New Guinea, from Weyland Mountains of Irian Jaya east, possibly to the Kratke Range of central Papua New Guinea; at altitudes of 4,590-9,350 ft (1,400-2,850 m).